Type 1, previously called juvenile-onset or insulin-dependent diabetes, is characterized by beta-cell destruction and usually leads to absolute insulin deficiency. Diabetic retinopathy is a disorder of the retina that eventually develops to some degree in nearly all patients with long-standing diabetes mellitus. While defects in neurosensory function have been demonstrated in patients with diabetes mellitus prior to the onset of vascular lesions, the earliest visible clinical manifestations of retinopathy include microaneurysms and hemorrhages. 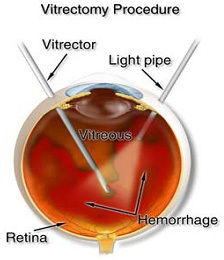 Vascular alterations can progress to retinal capillary nonperfusion, resulting in a clinical picture characterized by increased numbers of hemorrhages, venous abnormalities, and intraretinal microvascular abnormalities (IRMA). A later stage includes closure of arterioles and venules and proliferation of new vessels on the disc, retina, iris, and filtration angle. Increased vasopermeability results in retinal thickening (edema) during the course of diabetic retinopathy. Visual loss results mainly from macular edema, macular capillary nonperfusion, vitreous hemorrhage, and distortion or traction detachment of the retina. 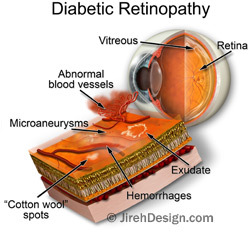 Diabetic retinopathy has four stages, mild nonproliferative retinopathy, moderate nonproliferative retinopathy, severe nonproliferative retinopathy, and proliferative retinopathy. These are determined based on fundus exam findings. There are times when you doctor at MERSI may need to perform fluorescein angiography or an OCT scan of the macula to further evaluate and classify your diabetic retinopathy. There are two main ways that elevated blood sugar in diabetes can lead to visual loss. Abnormal blood vessels can grow. Due to the fragile nature of these vessels they often leak and bleed causing blurriness and distortion of vision. Alternatively incompetent damaged blood vessels can leak into the macula, the part of the retina that is used for center vision. 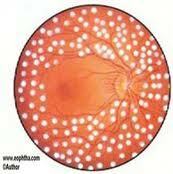 This leads to macula swelling also referred to as macular edema. All people with diabetes Type 1 or Type 2 are at risk to develop diabetic retinopathy. Duration of diabetes is a major risk factor associated with the development of diabetic retinopathy. After 5 years, approximately 25% of type 1 patients have retinopathy. After 10 years, almost 60% have retinopathy, and after 15 years, 80% have retinopathy. Of type 2 patients who have a known duration of diabetes of less than 5 years, 40% of those patients taking insulin and 24% of those not taking insulin have retinopathy. These rates increase to 84% and 53%, respectively, when the duration of diabetes has been documented for up to 19 years. Proliferative diabetic retinopathy develops in 2% of type 2 patients who have diabetes for less than 5 years and in 25% of patients who have diabetes for 25 years or more. These percentages are based on data from the 1980s before there was closer monitoring and tighter glycemic control, and they may have improved (Data from Preferred Practice Patterns AAO). At first, you might see a few specks of blood, or floaters in your vision. If this occurs please see your doctor at MERSI as soon as possible. As you may benefit from treatment before more serious bleeding occurs. Diabetic retinopathy and macular edema are screened for at your annual comprehensive eye exam. The physicians at MERSI can examine your retina for the earliest signs of disease, including; the presence of leaky or abnormal blood vessels, the presence of retinal exudate or areas of retinal ischemia, as well as any damage to the nerve tissues of the retina. If there is suspicion of diabetic retinopathy your doctor may recommend getting a fluorescein angiogram(FA) and an OCT scan. These tests are used to detect leakage from blood vessels and early accumulation of intra-retinal or sub-retinal fluid. During the first three stages of diabetic retinopathy, usually no treatment is needed, unless you have macular edema. To prevent the development or progression of diabetic retinopathy, people with diabetes should optimize their blood sugar, blood pressure, and cholesterol levels. Proliferative retinopathy is treated with panretinal photocoagulation(PRP) or scatter laser therapy. Panretinal photocoagulation works by shrinking abnormal blood vessels. However if the bleeding is severe, you may need to undergo retinal surgery to remove the blood in your eye. 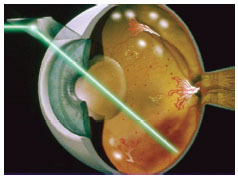 It is important to keep in mind that with laser therapy and appropriate follow-up the risk of blindness can be reduced However, treatment for diabetic retinopathy often can’t restore vision that has already been lost. That is why prevention is key and appropriate follow up with your doctor is crucial. If you have a lot of blood that accumulates and does not clear from the vitreous gel, the center of your eye your doctor may recommend surgery: pars plana vitrectomy(PPV) to remove the blood and restore your vision. During a pars plana vitrectomy a small instrument is used to remove the vitreous gel and blood that is obscuring your vision. As the vitreous is removed it is replaced with a balanced salt solution. A pars plana vitrectomy is typically performed in an outpatient setting with the patient going home after the surgery with there eye patched. Optimize HgbA1c: glycosylated hemoglobin, is a form of hemoglobin that is measured primarily to identify the average plasma glucose concentration. The HbA1c level is proportional to average blood glucose concentration over the previous four weeks to three months. A pivotal study, Diabetes Control and Complications Trial (DCCT), looked at thousands of patients with diabetes showed that better control of blood sugar levels delayed the development and slowed the progression of diabetic retinopathy. Other studies also showed that controlling ones blood pressure and cholesterol can reduce the risk of vision loss. If you or a family member has diabetes please make an appointment to see us at MERSI, so that we can optimize your vision; where we share a global concern for the united goal of preservation of vision and elimination of diabetic retinopathy and its complications and strive to eliminate it as a cause of blindness.